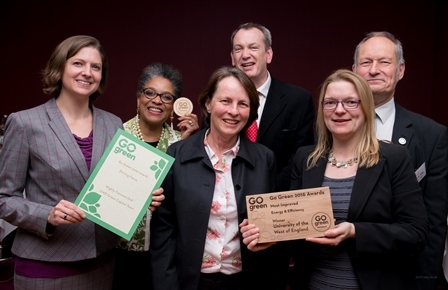 UWE has picked up two awards at the Go Green Business Awards 2016 Ceremony, held on Tuesday 18February at the Bristol Hotel, and organised by Low Carbon South West and Business West. The Awards recognise organisations and businesses in the South West who have made a commitment to, and are working towards, a sustainable future in the city. UWE Bristol's Energy Team picked up the 'Most Improved' award in the 'Energy and Efficiency' category, for a range of initiatives across the different UWE Campuses, including: the draught proofing of the Glenside Campus and encouraging students to engage in 'going green' via a game developed for Android phones. UWE Bristol's Green Capital Strategy Team were runners up and 'Highly Commended' in the top 'Driving Force' category. The award recognises the team, or individual, who has been a driving force in making the biggest green changes in an organisation throughout 2015. Staff and students from the Faculties, Services and the Students' Union worked together across the University, and in the city region, to deliver a varied an innovative programme of events, activities and opportunities to promote sustainability. Vicki Harris and Georgina Gough, the University's Green Capital Co-ordinators, received the award on behalf of the team.